The organ is one of the oldest instruments ever invented and has a range of power unmatched by any other instrument. Music is, and always has been, a very important aspect of church worship, particularly in accompanying congregational singing and playing sacred music during the Liturgy. The organ is generally considered to be the best way of providing this. However, because of its amazing sound quality, depth, and variety, the organ’s repertoire can also span most music genres. Our recently retired organist, Mark Blackwell, said: “the organ at St James is one of the finest in the area, is a great asset to the church and one commented on by many visiting musicians”. St James’s organ, originally built by Bishop for St Peter’s, Eaton Square in the 1830s, was bought for £150 by Revd Fitz Wygram in 1874. A year later an organ-blower was appointed at a salary of £6 a year. He carried out this work for about thirty-six years until a later refurbishment substituted an electric blower for the old hand-blowing mechanism. 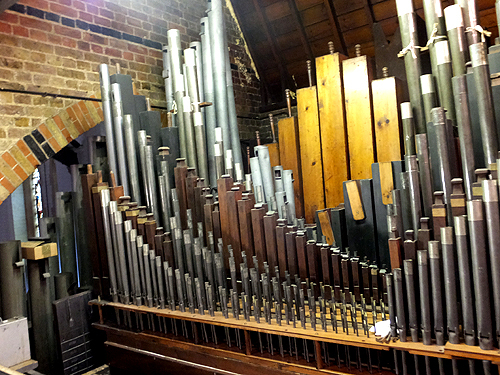 The organ at St James's Church is situated in the chancel, is now a three manual and pedal organ and contains hundreds of pipes of different sizes. The registration is now much improved. Members of St James's congregation and visitors to the church will probably be familiar with a somewhat distant view of the organ on the north side of the chancel as shown above. Only an intrepid few, however, will have ventured into the interior of the instrument, behind the console. Here can be seen metal and wooden pipes of many shapes and sizes and the wooden louvres that open and close to change the volume. 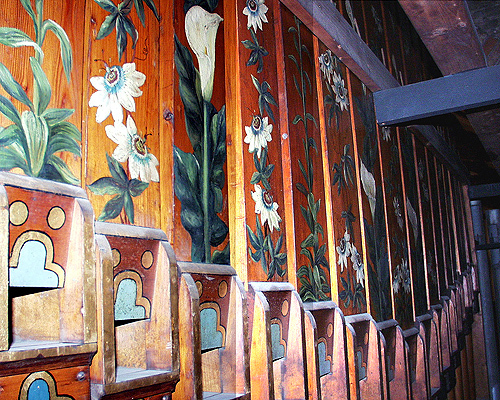 Lilies and foliage were painted in cream and gold on the pedal pipes in 1894, with the real gold leaf used being specially supplied by the Admiralty. These pipes were originally visible to the congregation, but unfortunately later they were moved to the rear of the organ chamber and substituted with the silvered metal pipes that now fill the arch. Some of these painted pipes are shown below. The old computer that controlled the organ has now been replaced using ‘switch stacks‘. See the photo album Inside the organ chamber. The organ is an extremely complex instrument, deteriorating with age and suffering from air leaks from reservoirs and pipe-work, deterioration of leather-work, rusting of wiring and relays, wood splitting, vermin damage and general accumulation of dust and dirt. These effects are minimised by regular maintenance, which our organ has had over the years, but even this cannot prevent deterioration. Consequently through the years the organ has undergone many cleanings, repairs, refurbishments, modernisations, additions and improvements, too many to mention here. 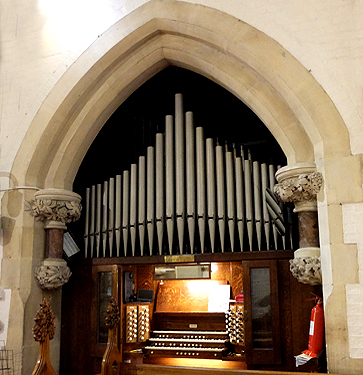 It was rebuilt as a three manual instrument with a pedal organ and new pneumatic actions in 1912 then in 1972 Bishop, the original builders, incorporated a new electric action replacing the old pneumatic mechanism. 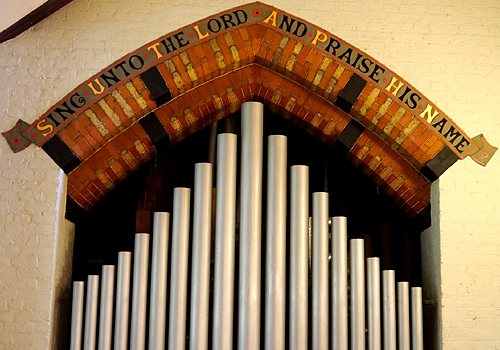 Twenty-five years later the organ was again overhauled, serviced, modernised and 162 new pipes of varying sizes were added. Some of the new pipes were salvaged from a neighbouring church while others were paid for by sponsors who were dubbed ‘organ donors’. Around 2015 various irregularities were noticed, including a whistling and hissing sound and also some notes being weaker and more ‘fuzzy’ than others. 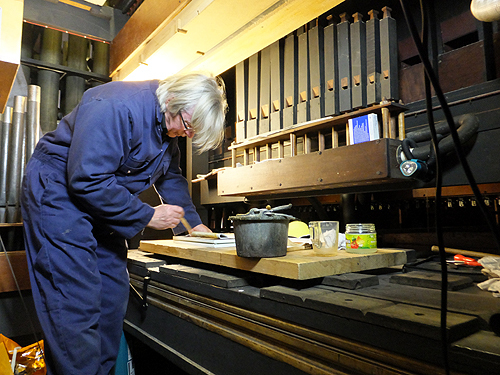 An examination by the organ restorer, Bernard Whitmill, revealed many technical faults causing these problems. Bernie spent about 16 months deep in the organ chamber, meticulously repairing or replacing the parts of the instrument that were broken or showing their age, thus causing problems, and also moving some pipes to their correct positions. The trumpet pipes now sound less powerful in the north aisle as they have been moved to the correct place at the back of the organ chamber. This allows more air to flow around the pipes (they need this to work) and also enables the sound from pipes nearer the front to push through into the church. Previously some notes were weaker than others because the air pressure was not consistent for each pipe. This has been corrected and the improved air pressure now gives a more even and pure sound. The organists are now warmer in cold weather - they were always cold due to the draft coming from the leaking air! The old computer that controlled the organ has now been replaced using ‘switch stacks‘, which Bernie has carefully wired up, replacing much of the old wiring as he worked. The only time the organ was totally out of use was for four months at the beginning of 2018. This was because many pipes had to be completely removed while the sound boards and wind chests were removed, repaired and restored. 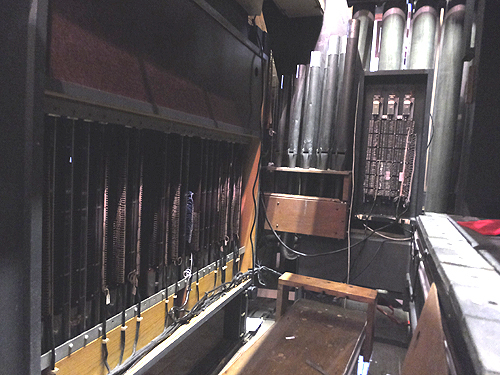 Have a look at the photo album Organ renovation. When the organist plays a note on the keyboard, pressurised air travels by means of bellows to at least one pipe. The air vibrates in the pipe, making a sound that may be anything from a high-pitched whistle to a deep, low-pitched note, depending on the size of the pipe - the largest pipe producing the lowest note, and so on. Each organ pipe produces a single pitch so the pipes are arranged in sets called ranks, each of which has a common timbre and volume throughout the keyboard range. 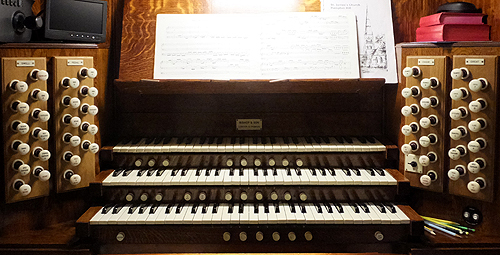 Most organs, including our own, have multiple ranks of pipes of differing timbre, pitch and loudness that the player can employ singly or in combination through the use of controls called 'stops' (shown below left). 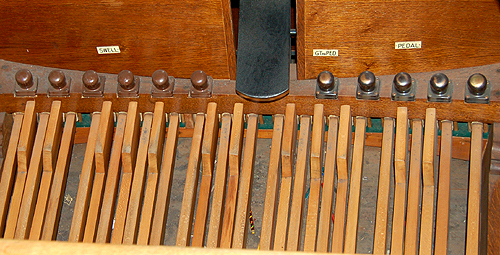 The 'stops' beside the keyboards control the varieties of tone so that the organ may imitate various musical instruments, both wind and string. The stops have names, like 'diapason', 'vox humana', 'flute', 'celeste'. The organist uses his hands on the three keyboards, called manuals (shown below left), and his feet on the pedalboard beneath the keyboard (shown below right), each of which has its own group of 'stops'. The organ's continuous supply of pressurised air allows it to sustain notes for as long as the corresponding keys are depressed, unlike the piano and harpsichord, the sounds of which begin to decay the longer the keys are held.